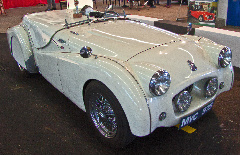 The Triumph TR1 sports car was originally given the designation Triumph 20TS. It was a prototype, and only one example was ever built. In terms of appearance, it was, in some ways, reminiscent of its predecessor, the Triumph Roadster, which was manufactured between 1946 and 1949. Since a high volume of sales was not expected from this classic car, then it was assigned a targeted selling price of £500 before sales tax. In comparison, the Triumph Mayflower saloon of 1953 was selling for £505 including taxes. Therefore, its design had to be economical. Because of this, all body panels were designed to require no more than one pressing. The rear of the car was short and had rounded edges, with the spare wheel bolted to the boot. The two seater Triumph 20TS sports car was previewed in 1952 at the London Motor Show in Earls Court. Its presence was met with mixed reactions. Typical of the criticisms was a somewhat cramped interior, and a distinct lack of space in the boot. In order to assess the car's handling and performance, the Standard Triumph chairman asked Ken Richardson, a test driver and BRM developement engineer, to put it through its paces. The outcome was that Richardson was unimpressed with the way the car handled, and its lack of performance. In fact, he described it as a "death trap". Apart from its poor handling, it had a top speed of only 80 mph, falling well short of the 90 mph targeted figure set by Standard Triumph. The outcome from this extensive development of the Triumph 20TS was the birth of the Triumph TR2 which was presented, in 1953, at the Geneva Motor Show. The reaction, this time, was completely different. The Triumph 20TS heralded the creation of the Triumph TR range. 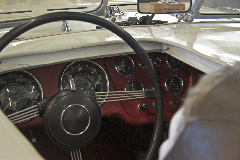 After the launch of the TR2, the 20TS was unofficially given the designation Triumph TR1. The above four images of the prototype TR2 depict, as I am led to believe, the "Record Run Version". This car set a world speed record for production cars in 1953, with a top speed of 200.9 km/hr. It used a 1991 cc, straight-4, with overdrive, developing 90 bhp. The images show the cockpit arrangement and the covering over the rear wheels.